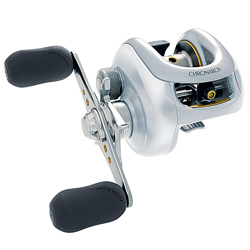 Shimano really trimmed off the ounces and improved ergonomics with the new D series, representing a major departure from the previous generation. Weight savings is achieved with an all-new aluminum frame and sideplate and an ultra-lightweight spool made from A7075 aluminum. Nothing was sacrificed in the way of power and smoothness; the D series retains the original A-RB (Anti-Rust Bearings) roller bearing, HEG (High Efficiency Gearing), SUPER STOPPER anti-reverse bearings, Super Free (SF), and VBS (Variable Brake System).